Members of the Ontario epilepsy community advocate at Queen’s Park for the implementation of an Ontario Epilepsy Strategy – left to right – Rozalyn Werner-Arcé, Executive Director, Epilepsy Ontario; Dr. McIntyre Burnham, a pharmacologist and director of the Epilepsy Research Program at the University of Toronto, as well as an Epilepsy Ontario board member; and Melanie Jeffrey, a member of the epilepsy community from Simcoe County. TORONTO, ON (March 6, 2012) – Today at Queen’s Park, 40 members of Ontario’s epilepsy community, led by Epilepsy Ontario and the Epilepsy Cure Initiative, gathered to meet with MPPs and policy advisors to increase awareness of epilepsy within government and advocate for the implementation of an Ontario Epilepsy Strategy. The key topics of discussion included the impact of epilepsy on Ontarians, consistent standards of patient care, improved access to treatment and disability and employment supports. Epilepsy, the second most common neurological condition after headache, is a seizure disorder caused by sudden bursts of electrical energy in a person’s brain. Up to one-third of people living with epilepsy do not have adequate seizure control, severely impacting their independence, productivity and overall quality of life. The disorder can cause significant challenges, including difficulty finding employment, loss of driving privileges, cognitive decline, memory impairment and higher mortality rates. “Far too many Ontarians still endure seizures, along with the damage each one leaves in its wake. Today, we call upon the Ontario government to ensure its citizens have swift access to new treatments for epilepsy as soon as they become available in Canada, in order to better their control seizures and improve their health and quality of life,” Werner-Arcé added. Epilepsy Action Day at Queen’s Park, an initiative founded by Margaret Maye of the Epilepsy Cure Initiative, provides individuals living with epilepsy the opportunity to speak directly to government representatives about the most pressing issues facing their community. In addition to consistent standards of care and better access to treatment, community advocates from across Ontario addressed the need for improved access to disability and employment supports. Institute (OBI) announced their support of The Epilepsy Discovery Project – New Approaches to Intractable Epilepsy. Led by Dr. McIntyre Burnham and Dr. Jorge Burneo, the project is described as “an unprecedented collaboration between Ontario’s premier academic researchers and doctors, not-for-profit epilepsy organizations and the private sector,” and is aimed at discovering new therapies and technologies to improve the lives of those persons affected by epilepsy who do not respond to any available pharmaceutical treatments. 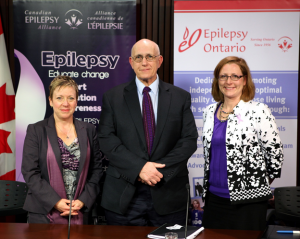 Epilepsy Ontario (EO) is a non-profit non-governmental health organization and registered charity dedicated to promoting independence and optimal quality of life for children and adults living with seizure disorders, by promoting information, awareness, support services, advocacy, education and research. Through a network of local agencies, contacts and associates, Epilepsy Ontario provides client services, counselling, information and referral services, education and advocacy services for children and adults living with seizure disorders, and for their families, friends, co-workers and caregivers. EO offers long-term programs to raise standards of care and support medical research into seizure disorders. EO hopes to improve public awareness and education through publications, the EO web site, conferences, and outreach programs. Epilepsy Ontario will soon launch a new information and referral program to be led by an Epilepsy Information Specialist.